Belvoir presents THE GREAT FIRE, by Kit Brookman, in the Upstairs Theatre, Belvoir St Theatre, Surry Hills, 6 April - 8 May. I saw this production weeks ago, towards the end of its run. My impression of the play was that of an ambitious but lumbering four-act play in the mode of Chekhov. 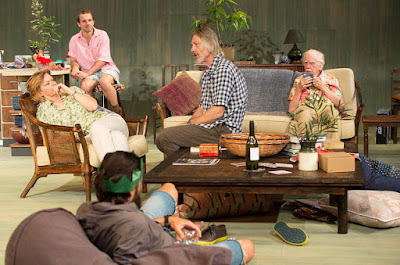 It reminded me, mostly, in Australian terms, of Alex Buzo's BIG RIVER (1985) - another big family saga, set in a big rambling house on the Murrumbidgee/Murray River basin, based on the history of the writer's own family but set toward the end of the nineteenth century - incidentally, never performed professionally in Sydney (I, particularly, like it). The similarity to Mr Buzo's play is that Mr Brookman's play, is set in a big rambling house in the Adelaide Hills, peopled with actors, playwrights and other artists much like the writer and his family. Both playwrights, then, drawing on personal knowledge to sketch their interests and develop their 'poetic licence' - just the usual creative process, of course. The Chekhov connection, in the general tenor, is that of any of Chekhov's plays, but more especially, most likely, that of THE CHERRY ORCHARD - there, too, as in THE GREAT FIRE, family and friends gather, discussing personal stuff, intermingled with 'arty' stuff and some political stuff, furnaced with the imminent selling of the family home. The memory of Mr Brookman's family home and those days and people are THE GREAT FIRE's major strength but, also, its weakness. If it is his family, the characters on the page, and certainly in the playing, are sketchily drawn with mostly external observations of personality and conversation and casual physicalities serving the material, with little internal exposures. I felt the writer knew who these people were and knew a lot about their backstories - their past - the reasons for the way they are and what they want, but failed to put it on the page for the actors and audience to grasp. This is where Chekhov shows us the way to do that and why all his plays have on the page clues for the actor to endow imaginatively, to create a whole life for their character - Chekhov gives the artists and audience their character's past, their present and their future, in what, appears, on the surface of the writing, to be banal and meaningless conversations. Thank you for building this house that Lily and and Michael live in like penitents, thank you for instilling us with this idea that poverty is noble, telling us how organic vegetables really do taste better and that they're so much better for the environment, how amazing Japan is, well you can afford it! ... And you've polluted and ruined the planet, but we're the ones who'll have to suffer, we'll be the ones who have to dig the human race out of that particular hole, if we can, doing our best to keep things less completely catastrophic! That's the best margin we can aim for! And you think that our generation has a disproportionate send of entitlement?! The actors had created some flesh and blood people, wonderfully, despite the very shallow writing. That we were entertained at all was due to the quality of the performers that the Director, Eamon Flack, had got together: Peter Carroll, Sandy Gore, Lynette Curren, Genevieve Picot, Geoff Morrell, Eden Falk, Yalin Ozucelik, Shelly Lauman, Sarah Armanious and Marcus McKenzie. The more vintage (years) the actual actor had around her or his 'belt', the more successful the creation was, I felt - due, mostly, I suspect, to their experience with a lot of Australian writing, which has given them the skills, the ability, to create without many authorial details on the page to back it up. The writing in THE GREAT FIRE reminded me very much of the difficulty of Alex Buzo's repertoire for contemporary production (e.g. ROOTED-1974; CORALIE LANSDOWNE SAYS, NO -1975), he knew who his people were in his plays, and they worked best, originally and successfully, because the actors knew who the role models were, too - because it is rarely on the page of his text, in much, or any depth - he wrote, mostly, satiric observations, hung on the knowledge of a 'real' personage that one had to know to bring to life. So, too, this is true of Mr Brookman's play I suspect. Meet his family and you might get a clearer cluing from close observation of who and what and why his characters are, than from the writing in the text. For, the best performance, on the night I saw the production, was that of Marcus McKenzie as the youngest son of the family, Tom. Tom had a secret. Tom was more than what he said or did. Tom was intriguing, something BIG was going on, the depression, merely, a symptom. I wondered if my response to Tom was because I suspected that Mr McKenzie was basing his offer on a close study of the writer, himself, and that I thought I recognised some of the verbal, vocal and physical traits of Mr Brookman in Mr McKenzie's work, and so was able endow from a knowledge of the writer, through acquaintance, that I endowed a depth to the characterisation to Tom, that was not written on the page, but vividly created/re-created by the actor. This production showed good actors keeping an underdeveloped text afloat, just. I had seen, the same week, as this production, an appalling production of the David Mamet adaptation of Anton Chekhov's THE CHERRY ORCHARD at the New Theatre, Directed by Clemence Williams (a recent graduate of the Director's course at NIDA) and saw a great play glowing still above the ineptitude of the artists involved (not all, there were two or three exceptions of integrity and insight) and wished that these good actors at the Belvoir had the honed Chekhovian source material to reward their valiant gifts. There is nothing more demoralising than for an actor having to 'flog' a dead horse with all his present gifts, whether it be New Australian material, or else! Just how many drafts and development workshops had THE GREAT FIRE been put through? Not enough, I'd say. And yet Mr Flack and his artistic advisers at Belvoir had thought that it was the best of the new Australian writing available for Belvoir to present and for us to relish. 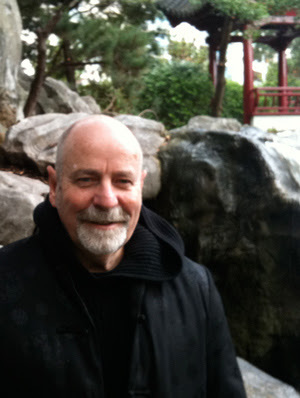 On May 3, Lachlan Philpott, an established Australian playwright (COLDER, SILENT DISCO, TRUCK STOP, LAKE DISAPPOINTMENT) wrote an opinion column in the Sydney Morning Herald, titled: "Shakespeare's hour upon the stage is up, give him a break" opining the regular productions of Shakespeare's work in Sydney theatre, suggesting that there is too much and that a five year moratorium/rest ought to be declared before we see another one. Shakespeare is everywhere and Australian playwrights are not. ... Five years will allow space for other living writers to flourish in the gaping holes his absence leaves. If THE GREAT FIRE is representative of the realisation of new Australian work, in 2016, might I suggest as well as Mr Philpott's five year moratorium on the production of Shakespeare, that every new work have a five year development plan of drafting and workshop before we see it on a professional stage. Both ideas are preposterous but if THE GREAT FIRE, as it was revealed, is the best new Australian work that Belvoir can find, something is wrong, and something needs to change. We have a point of agreement Mr Philpott. Clearly, Mr Brookman has the eyes and ears of the Artistic Management honchos - the gate-keepers - of various companies in Sydney, for last year we also saw his woeful A RABBIT FOR KIM JONG-IL at the Griffin. Had the Belvoir management not seen that work and not become more scrupulous, more demanding about the preparation of THE GREAT FIRE? Undoubtedly, I believe there is potential in this work and I was certainly enamoured with Mr Brookman's play, SMALL AND TIRED but much more drafting and workshopping ought to be have been provided. And I should say, tell Mr Philpott, that I would rather see a Sport For Jove production of THE TAMIMG OF THE SHREW, again, than either THE GREAT FIRE or LAKE DISAPPOINTMENT ever again! And if I had to encourage a young audience to attend the theatre I would rather that they saw the intellectual liveliness and theatrical skill of Damien Ryan's Shakespeare than any recent Australian play, bar Andrew Bovell's THE SECRET RIVER and Kylie Coolwell's BATTLE OF WATERLOO - but then most of the kids I know who should and would have relished those stories couldn't afford it. The Design of the Set by Michael Hankin was mostly satisfactory, open and spacious, but had a poorly executed solution, almost an afterthought, to the change of location for the last act - lazy? The contemporary clothing was executed well by Jennifer Irwin. Damien Cooper is always a boon to any production he Designs the Lighting for, and the Composition and Sound Design, by Steve Francis, was sufficient to keep all in the world of a fire summer in the Adelaide Hills. Mr Flack gives us TWELTH NIGHT, next, a Shakespeare - who should we alert that that Dead White Male has claimed another stage time with a very good play? With irony and a reluctant sense of cynicism I should report that "THE GREAT FIRE" was originally commissioned by Belvoir in association with ArtsNSW through the NSW Philip Parsons Fellowship for Emerging Playwrights (previously the Young Playwright's Award).